“What did you do while I was gone?” Said the boy with a hint of accusation embraced by curiosity. His face told me that he didn’t buy that answer. I’m not sure he liked that response. I kind of squashed the illusion of Tab and I being off on some grand adventure while he is away. Oh well. At least I got a few things done. Amazing what one can do when their child is away at Vacation Bible School. Designed this banner for the next sermon series my church is going through. Played around with Scuba flag colors before landing on this more Finding Dory-like design. As always, fonts are fun! 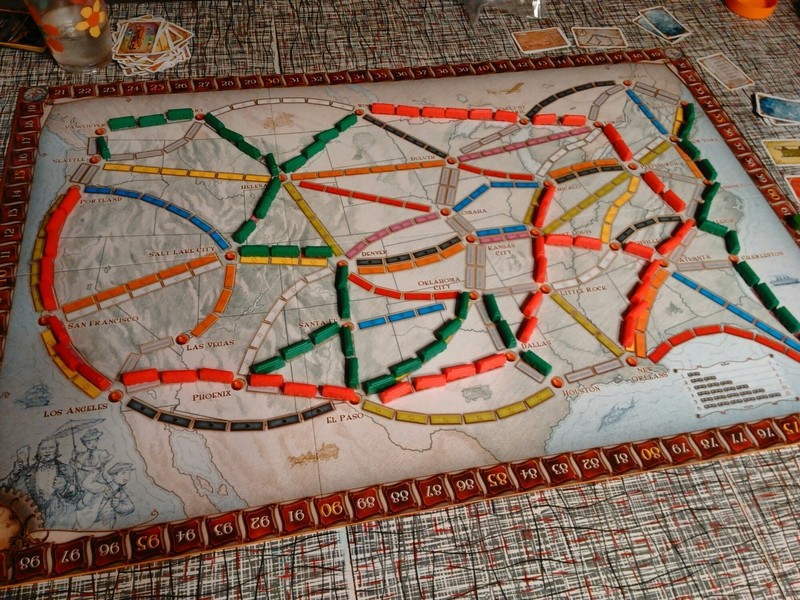 Played a game of Ticket to Ride tonight. Lost by 5 points to my beautiful bride. Thought I was going to win too having the longest path. Trench Run’s great innovation is deathlessness—players flop like fish once “killed” in the hopes of finding a health kit to get back on their feet. This means downed players stay in the game even when they’re “out.” Practically it means everybody has fun, even when somebody is dominating, because there’s always a chance to get back on your feet again (literally and figuratively). You can read more of his Indie Haven piece here.